Notes: Good blood-purifying properties. First year roots edible. 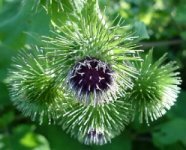 ARCTIUM LAPPAone of the foremost cleansing herbs, providing nourishing support for the blood, the liver, and the natural defense system. It's rich in Vitamins B-1, B-6, B-12, and E, plus manganese, copper, iron, zinc, sulfur, and more.